Seven studies for designers and marketers about the complex and bizarre science of the color red. When people look at the color red, their blood pressure rises. They blink more. Compared to other colors, red triggers measurably more physiological arousal and neural activity. In the area of the monkey brain that processes hue, more neurons cue into red than to any other shade. Red ties hurt a job candidate’s chances. The power of red is even more intriguing because it changes with a given situation. Stop signs, fire alarms, bold lipsticks, corrective pens, blushing cheeks, angry eyes–they all put us on alert, but in very different ways. Sometimes red revs us up (men universally find it attractive on women, perhaps because they tend to wear it at peak fertility) and sometimes it cools us down (red ties hurt a job candidate’s chances). Its effect is puzzlingly potent: Sports teams wearing red uniforms win more, and people, when they see red, make a stronger fist. “It seems that red is strongly related to human motivation, and that makes it a powerful cue to initiate basic behavioral tendencies even without being aware of its influence,” Maier says. The color truly shapes our actions at a subconscious level. Yet the color’s effect on any one individual is curiously variable. “What is really remarkable is the fact that one and the same color can exert opposite behaviors depending on the circumstances under which it is displayed,” psychologist Markus Maier of Ludwig Maximilian University in Munich, who has been studying red for years, tells Co.Design. Some of the effects seem innate–one-year-olds behave differently toward red than other colors–while others are clearly learned. However acquired, says Maier, associations with red can shape our actions at a subconscious level. But because the color wields such erratic force, designers be warned: Incorporate red into your work with caution. In a retail setting, some evidence suggests that a red exterior might attract customers, but that a red interior might repel them. In a conference setting, red might boost bids during an auction but dampen offers at a negotiation. In a school setting, red might help students pay attention to details but may hurt their scores on creativity or IQ tests. “Red can mean danger and it can easily mean passion,” says Lauren Labrecque of Loyola University Chicago, who studies the role of color in marketing. Labrecque’s recent research has found that simply changing the color of a fictional logo or package design can influence a brand’s personality. A dark red box of condoms, for instance, was perceived by test participants as more rugged than a light purple box of the identical product–and that, in turn, made participants more likely to buy the red box. To help clarify the uncertain effects for designers, marketers, creative professionals, and sports teams, we sum up seven of the most fascinating, complex, or bizarre red research studies from the past decade. Evolutionary anthropologists Russell Hill and Robert Barton of University of Durham, in the United Kingdom, analyzed the outcomes of four 2004 Olympics sports events, in which contestants were randomly assigned to wear either blue or red outfits. The red side won significantly more chance would predict across all four sports, 16 of 21 rounds of competition, and 19 of 29 weight classes. Hill and Barton suspect that a red uniform’s association with aggression and anger might tip the competitive balance “when other factors are fairly equal.” The only question left for Red Sox fans is why the effect took almost a century to kick in. In schools, red might help students pay attention to details but may hurt their scores on creativity. 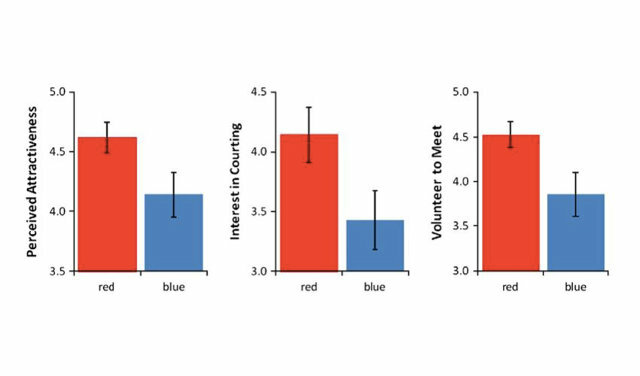 In a series of four experiments, researchers (including Maier) found that very subtle color prompts had a measurable effect on testing performance. One study issued part of an IQ test to measure participants’ responses to a cover page that was red, green, or white. They were only briefly exposed to the color, but participants in the red group performed significantly worse than those in the other groups (see below). Researchers believe that in a testing context, red may activate negative emotions (think: alarm or mistakes) and thus could have a negative impact on scores. In light of the 2007 study (above), researchers Ravi Mehta and Rui Zhu wondered whether red had a negative impact on all cognitive tasks or merely some. Sure enough, a series of experiments found that red sometimes has a positive effect during tests; on a proofreading test comparing names and addresses, for instance, participants who worked at a computer with a red background did better than those with a blue one. Mehta and Zhu suspect that on detail-oriented tasks, red’s association with mistakes might actually heighten attention. If red truly indicates a threat or an alarm, one might also expect it to prompt a physiological response. Andrew J. Elliot of the University of Rochester, a psychologist and veteran red researcher, tested out that idea a few years back. He and a collaborator gave test participants a hand grip, then showed them the word squeeze–in red for some, and in blue or gray for others. Those in the red group not only squeezed harder, they squeezed harder more quickly. “We suspect that the influence of color on biological and psychological functioning is actually quite pervasive,” they said.